Do you ever get stuck in the Internet shopping black hole? It’s a very real thing. Like, it actually blows my mind when I think about back in the day when I had to get off my couch or out of my bed in order to purchase anything. What a pain that was. This year, I bought every single one of my Christmas gifts online. But that also means I spent a whole lot of hours Internet shopping. I am not a quick shopper by any means when it comes to online shopping. I like to do my research, scroll through a million pages of clothing and goodies, find coupon codes, abandon my shopping cart, etc., etc., etc. I’m pretty sure I could get my shopping done in a fraction of the time if I just got in the car and went to the mall. But that’s the beauty of the Internet… There are SO many things to buy! Way more than the mall could ever hold. It’s a glorious heaven. And also a deep dark black hole. One of the websites I love to endlessly scroll through is UncommonGoods. It’s long been one of my go-tos for gifts for people for whom I have no idea what to purchase. Which only seems to grow every year. It’s kind of like a giant craft fair online, but a really, really classy one with incredibly high-quality goods that make you swoon. The company’s mission is to provide a platform for artists and designers and to connect them with their buyers. Each product on the website features story about its maker, often with a picture, too. I absolutely love knowing where my purchases are coming from and knowing that there are real people behind the products. When UncommonGods reached out to me to partner on this post, I was totally on board since I already knew about and believed in the website’s mission. 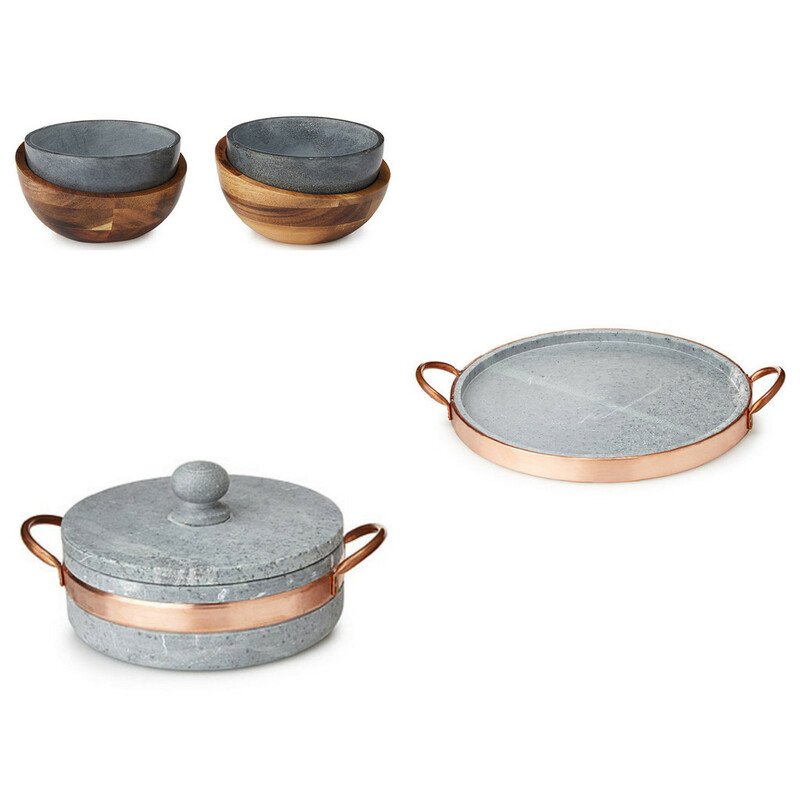 I picked out a few goodies to play with in the kitchen, including all of this beautiful soapstone cookery. And I whipped up quite the feast! 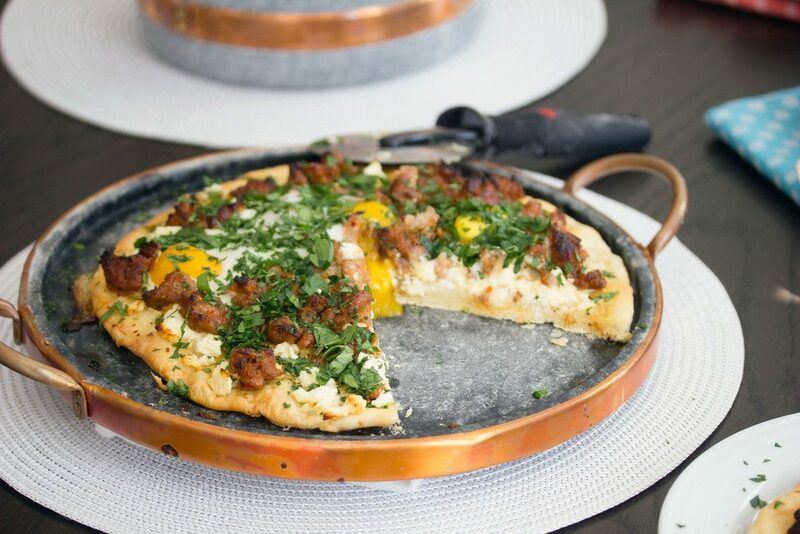 Starting with a Spicy Sausage Pizza with Feta and Parsley. I was excited to use my new soapstone pizza pan with copper handles and am in love with how it’s both functional and totally fashionable. I made a garlic dough for this pizza and baked it on the stone. I topped the pizza with a very generous amount of spicy sausage and feta. And obviously cracked a few (OK FOUR) eggs on top. 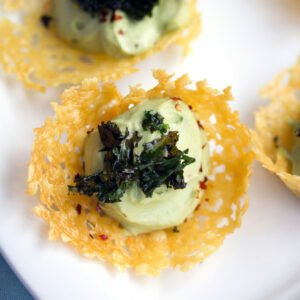 Then went a little crazy with the parsley. I’m clearly not a minimalist when it comes to pizza. Am I the only one obsessed with parsley? Like OBSESSED. I could eat it by the handful. And I do. 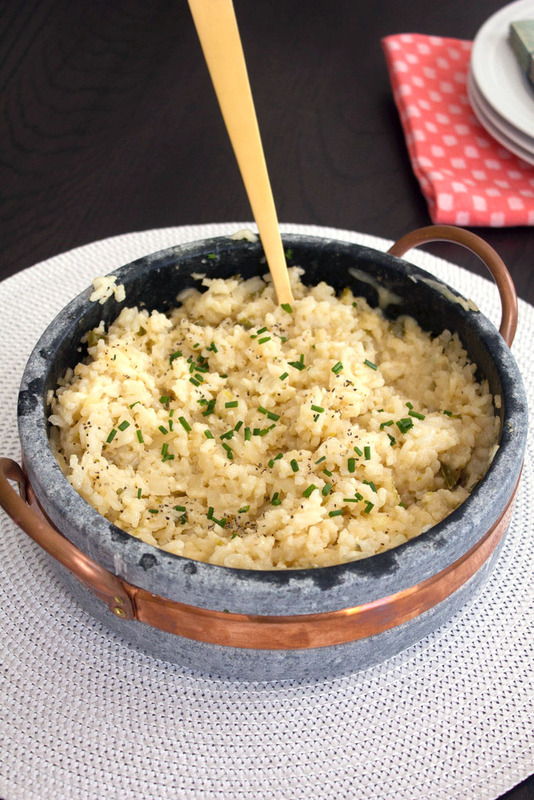 I also made this Lime Jalapeño Cheddar Risotto (recipe coming soon!) in my soapstone pot with copper handle. This pot is so gorgeous, I want to just keep it on my stove all around the clock. 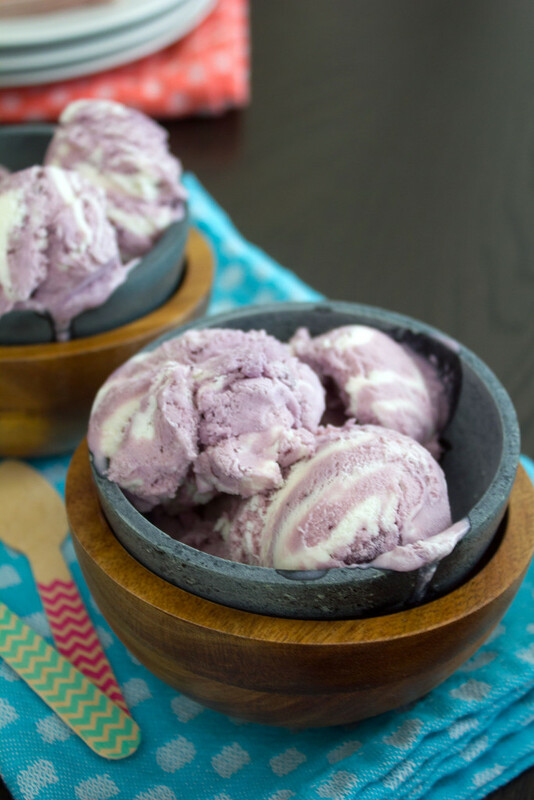 And ice cream! Once again in soapstone bowls. These bowls are perfection because they keep cold things cold and hot things hot and that little wooden bowl keeps the elements away from your hands. 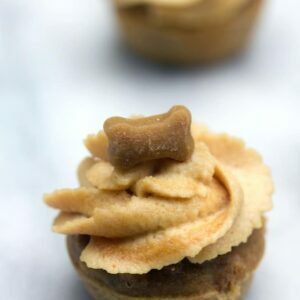 Plus, they look pretty sweet. I’ve used a lot of different pizza pans in my pizza-making days (cookie sheets, pizza stones, etc. ), but without a doubt, this one is the best looking. The pizza looked extra fabulous and slid off the pan easily. 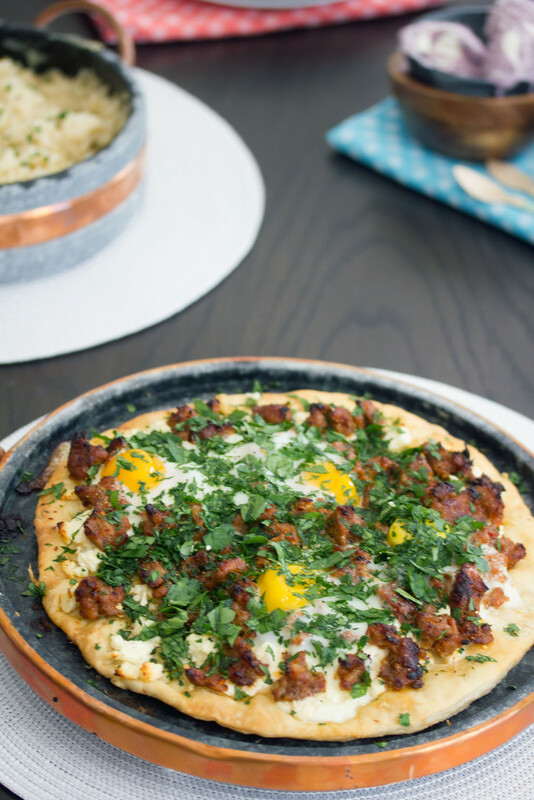 The dough ended up the perfect combination of crispy and chewy and the toppings galore made me an incredibly happy girl. 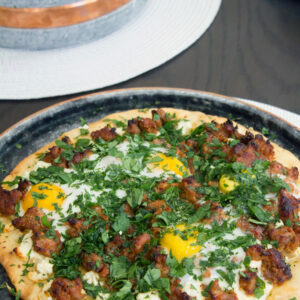 There’s nothing quite as heavenly as a runny egg yolk on a pizza. Unless it’s runny egg on a pizza covered in sausage. 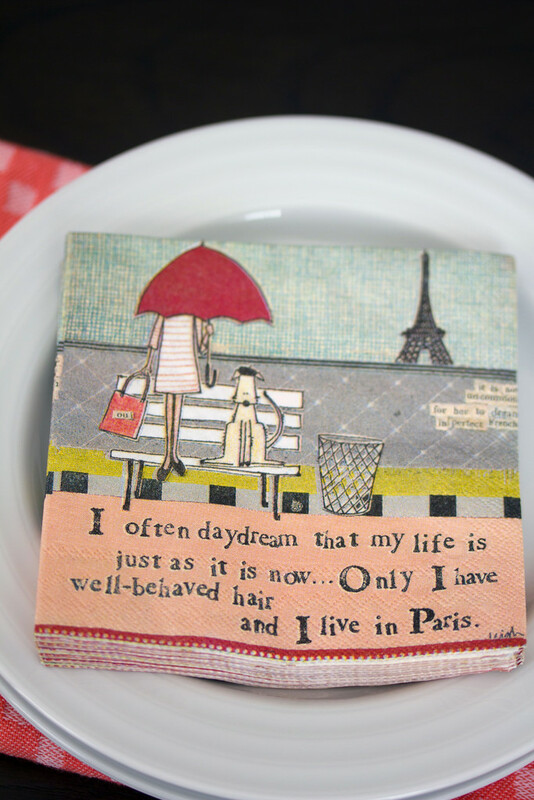 Do you ever marvel about how your life can be so perfectly summed up on a cocktail napkin? This is me to a T… Also, that looks like my dog. But with a beret. CurlyGirl does it again. 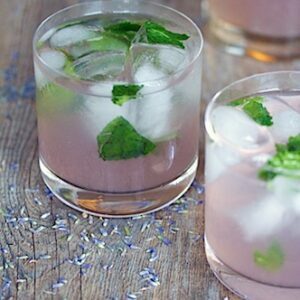 If you’re going to throw a dinner party, I think cocktail napkins are essential. Stock up now and you won’t be sorry. I love that all my new serving pieces go so perfectly together. Something tells me soapstone is going to majorly step it up in popularity over the next year and soon we’ll be seeing it everywhere. I just think it’s some of the classiest and prettiest servingware around, making anything you cook even better looking. Not that your food needs any help with that, right? If you’re struggling with what to get as a gift for someone you love… Or simply want to fall into a beautiful black hole of online shopping, take a browse around UncommonGoods. 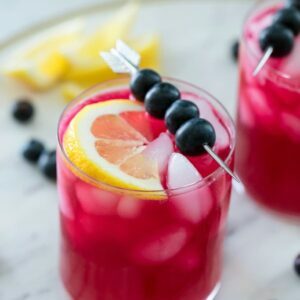 I especially recommend the site for unique wedding and baby shower gifts, fun cookware, and gifts that really express your love. Their gifts for kids are SUPER cute, too. However, I’m already feeling serious regret that I didn’t pick up these Sword Campfire Roasters. I mean, seriously? Amazing. What’s the most unique piece of cookware you own? 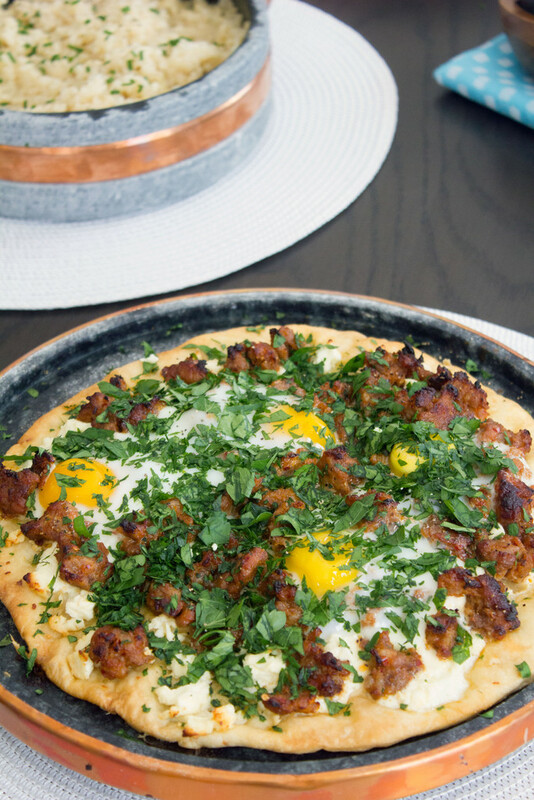 Spicy sausage, feta cheese, and parsley combine for this incredible pizza, made even better with eggs cracked on top. 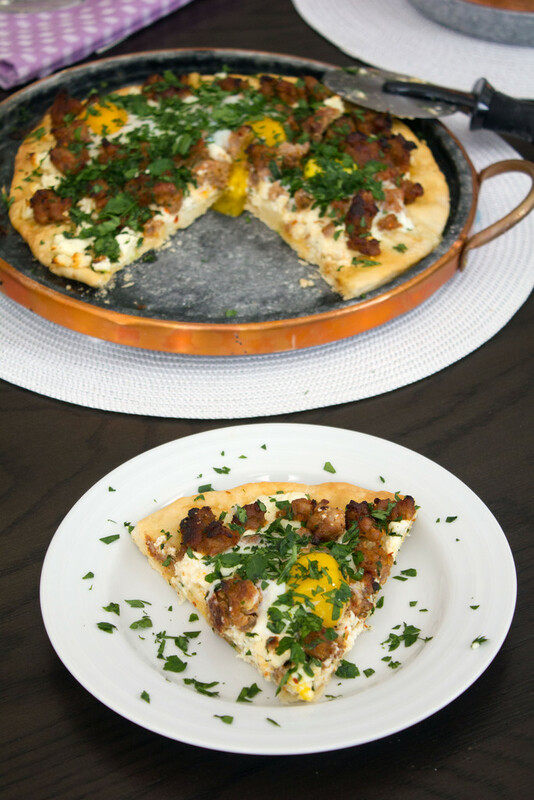 You'll want this pizza for breakfast, lunch, and dinner! Pre-heat oven to 450 degrees. Place pizza stone or baking sheet lined with foil in oven to heat. On a lightly floured surface, roll out dough into a large circle. When oven is pre-heated, lightly sprinkle flour over pizza stone or foil-covered baking pan and place flatbread dough on top. Lightly brush with olive oil. Bake dough for about 5 minutes. Remove from oven and sprinkle sausage over the top of the dough. 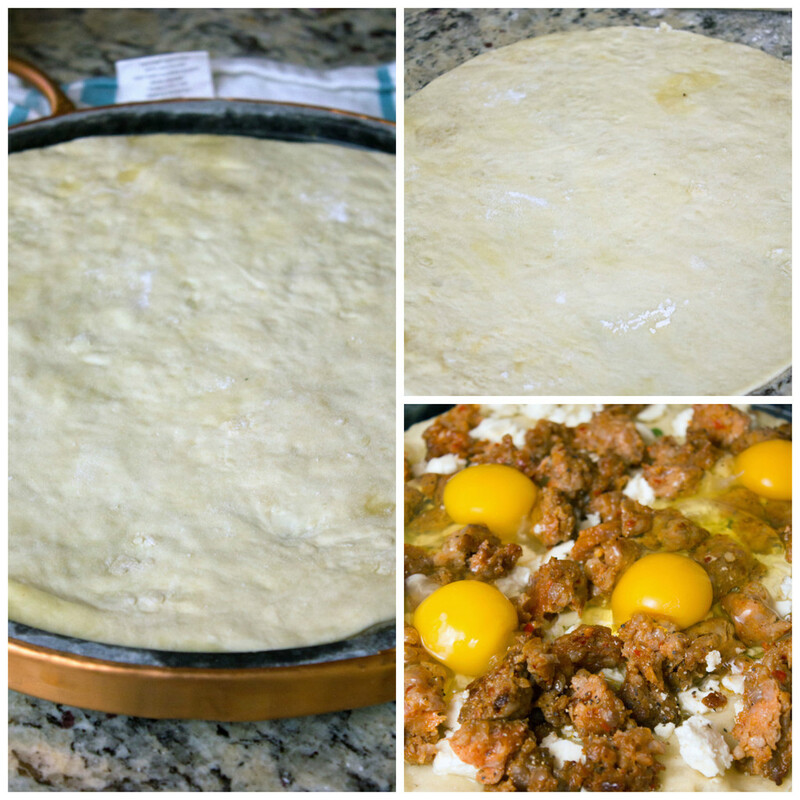 Add on feta cheese and crack eggs over the top, making sure to evenly space out. Place back in oven and bake for another 7 minutes, until crust is turning golden and eggs are just set. Sprinkle chopped parsley over the top of the pizza. Mix yeast and water in a large bowl and let rest for about 2 minutes. With a wooden spoon, mix the flour in. If dough is dry, add more water, 1 T at a time. Cover bowl with a towel and let rest in a warm spot for about 2 hours. Dough should rise during this time. Wrap in plastic wrap and refrigerate until ready to use. 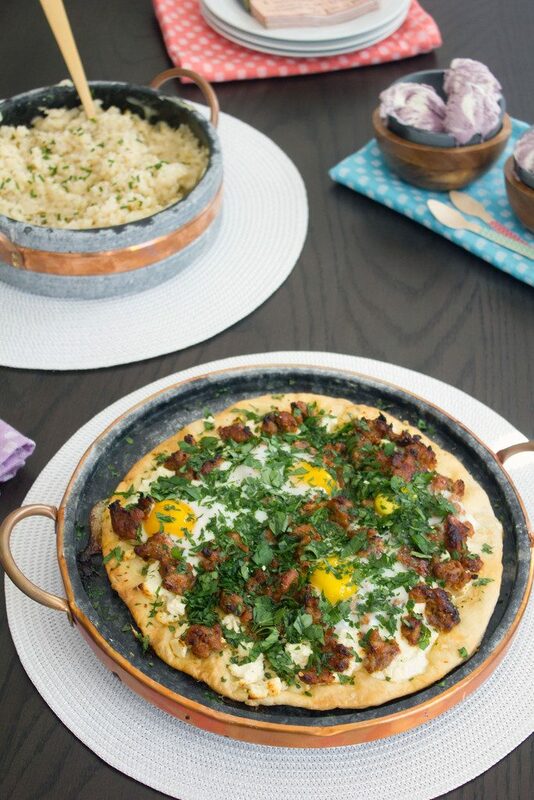 Recipe makes enough for two large flatbreads. Thank you so much to UncommonGoods for sponsoring this post. Though this is a sponsored post, all opinions are 100% my own and I only work with brands that I truly believe in and love. 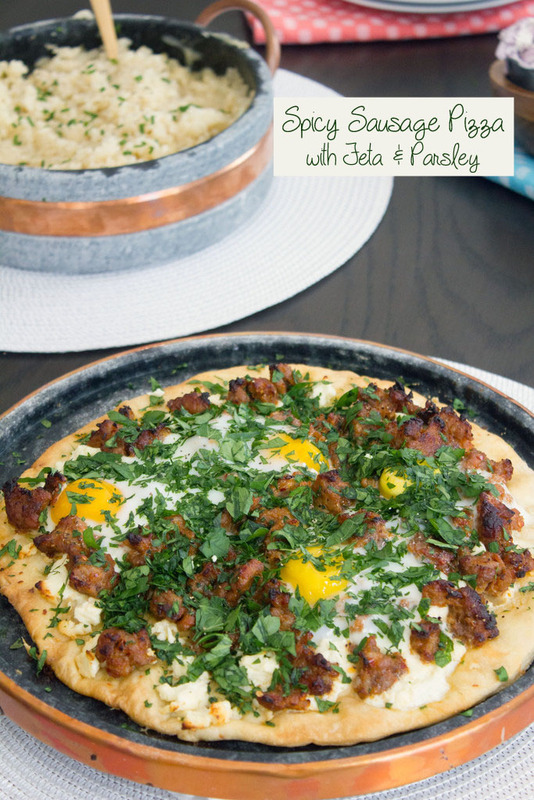 9 Responses to "Spicy Sausage Pizza with Feta and Parsley"
This is such a great Friday night dinner– And those serving pieces are beautiful! The baking/serving pieces are so beautiful.. And the pizza looks deliciously amazing! Thanks for sharing!! Yes! I love pizza, and I love all the toppings you piled on – so good. I wish I had this for dinner tonight! Oh good LORD! The items you chose are beautiful!!! What a great gift they would be. Oh my god. This looks so good I can’t even find words!